Since Veteran’s Day in 1977, Wichita has paid homage to the men and women who have fought and died in various wars throughout history. 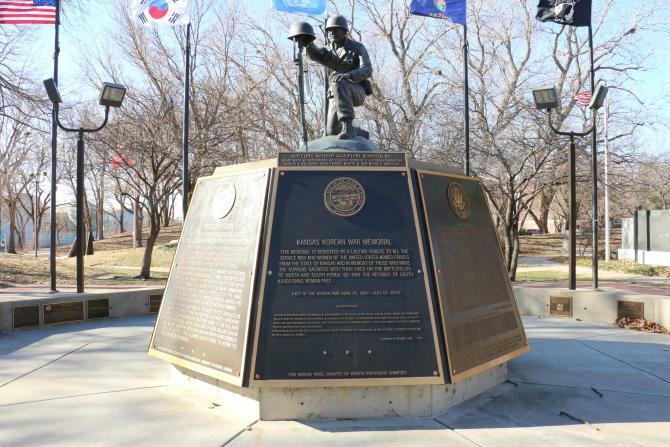 Statues and sculptures honor their bravery at Veteran’s Memorial Park in downtown Wichita. This 4.5-acre park is just one of three in the country that houses a Berlin Airlift Memorial. From the Bicentennial Flag Pavilion to the 18 memorials representing six wars and every branch of the military, visitors can pay their respects to those who have given the ultimate sacrifice. 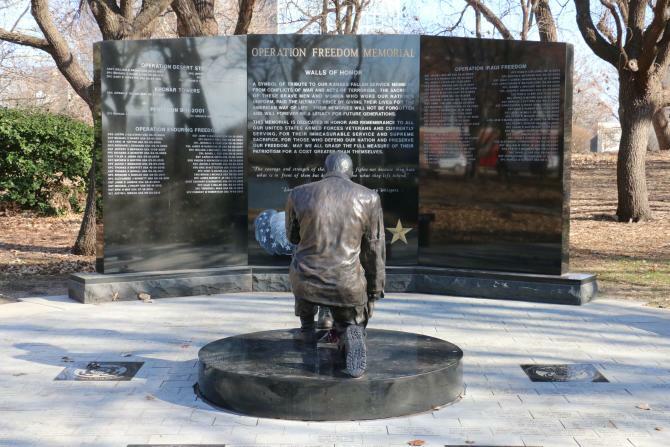 Take the “Veteran’s Memorial Walk” along the east side of the Arkansas River right to the park and witness for yourself this beautiful and unique collection. The tour takes about 1-2 hours to complete. Designed in 1976 and dedicated in 1977, this pavilion houses 15 flags representing the evolution of America over the past two centuries. From the flag that once flew on Christopher Columbus’ Santa Maria to the current United States of America flag, learn how each were used throughout history and why each are important to the building blocks of American society. 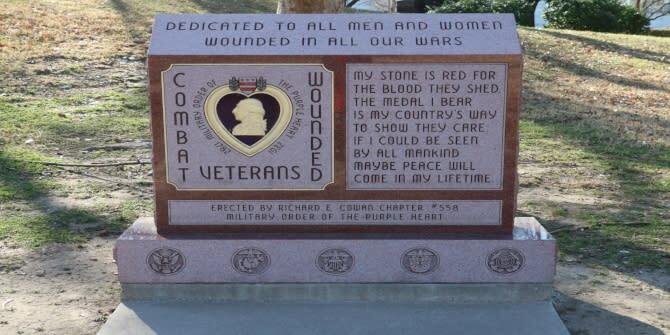 The Purple Heart is a prestigious military award inspired by an award created by General George Washington in 1782 – the Badge of Merit. It is the oldest award to be given to combat soldiers, sailors, Marines, airmen and merchant mariners for those wounded or killed in the line of duty. The Badge of Merit was revived in 1932 as the Purple Heart, and was given to all wounded veterans from World War I onward. This memorial was dedicated in 2004. Members of the Gold Star Wives of America include the wives, sweethearts and other loved-ones of those lost in World War II, the Korean War, the Vietnam War and other military campaigns. The Air Capital Chapter has more than 40 members. Many prisoners of war are believed to have been captured while serving and kept for slavery, or tortured until their death without being reported, despite rules set in place by the Geneva Convention in 1864. Those rules state opposing forces MUST list the names of all persons captured or killed in combat. There are more than 78,000 POW soldiers from World War II, 2,000 from the Korean War and 3,000 from the Vietnam War. This monument remembers all those lost with Kansas ties. National POW/MIA Recognition Day is the third Friday in September. The Vietnam War is one of the most controversial wars in history as people still debate today over whether America had any business getting involved. Politics aside, more than 58,000 U.S. troops were killed during the conflict in Vietnam, Laos and Cambodia between November 1955 and April 1975. The war was officially fought between North Vietnam and South Vietnam, as a struggle for communist power in the north forced its way to the south. The United States came to the aid of South Vietnam, but soon had to pull out because it couldn’t handle the burden of losing large amounts of money or soldiers. Eventually, it caused South Vietnam to fall to the communist government. As Americans against the Vietnam War turned their backs on Vietnam veterans, controversy arose around the American government as to whether America should have been involved in the first place. 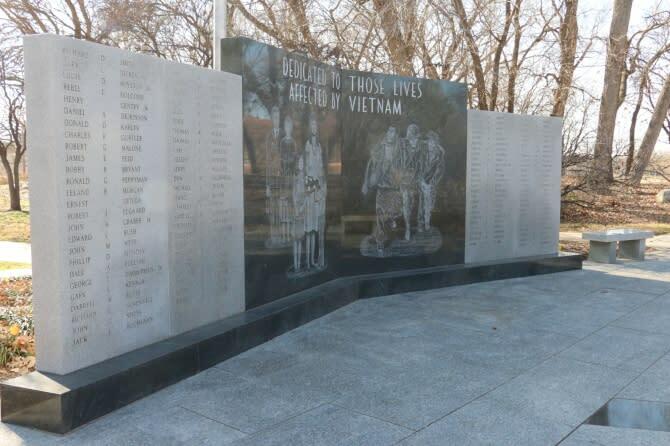 In 1993, the Vietnam memorial at Veteran’s Memorial Park in Wichita was the first memorial built since the Bicentennial Flag Pavilion in 1977. 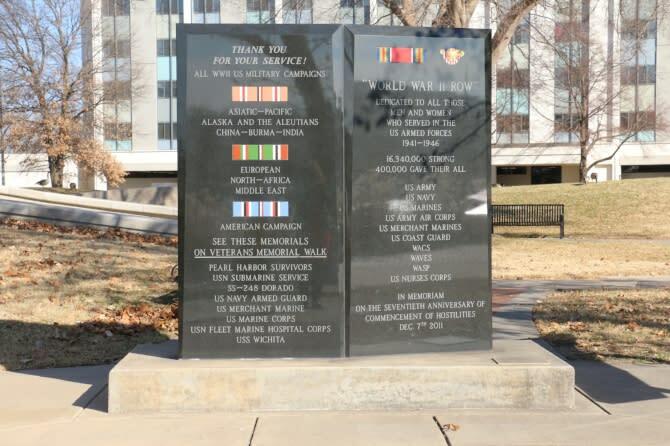 It houses the names of all the service men and women who died in Vietnam who have Wichita ties. 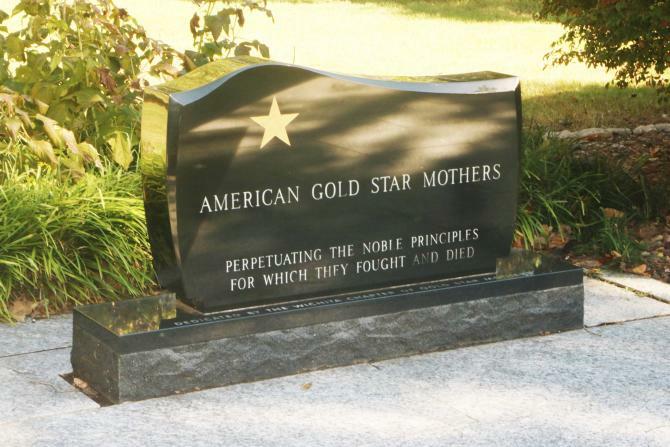 In 1929, the Kansas Chapter of the American Gold Star Mothers formed to create a support system for mothers who had lost their children in battle. This group of about 200 members raised money to create a black granite sculpture at Veteran’s Memorial Park, which was built in 2004. 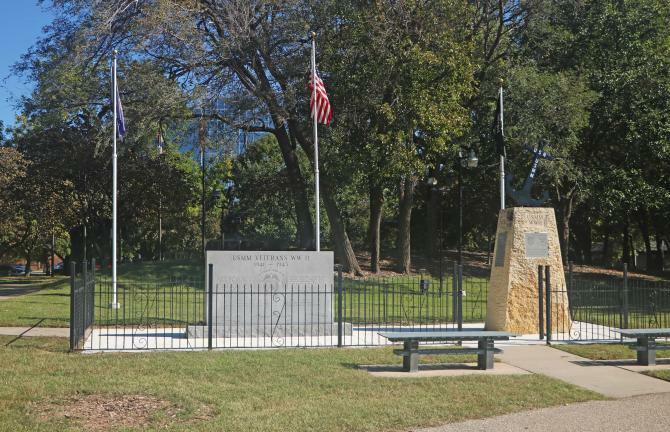 With the help of money raised by the Kansas Korean War Veteran’s Association, Richard Bergen finished this memorial in 1996. It includes the American, Korean, Kansas, POW/MIA and Korean Veteran flags as a tribute to those who served. 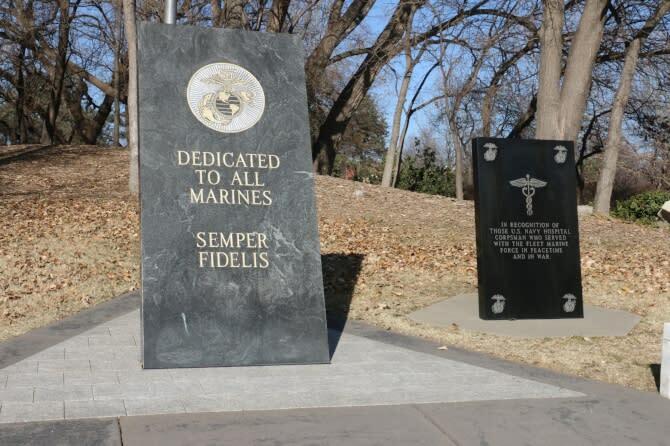 Built by the U.S. Marine Corps League, this memorial honors all Marines. On the back, you can read the names of several of those who have paid the price for freedom. Paired with the U.S. Navy Hospital Corpsmen, many who served and gave medical care during battle are also honored in this memorial. These military men manned ships during World War I and World War II to carry goods across the oceans. However, many of these vessels were not armed. That meant many loads of goods and many lives were lost when the ships were hijacked. The U.S. Navy Armed Guards were known for carrying defensive weapons and defending the waters. This memorial honors both groups for their contributions during wartime. Soldiers who enlisted in the Submarine Service were also known as “The Silent Service,” as many went undetected deep beneath the sea. 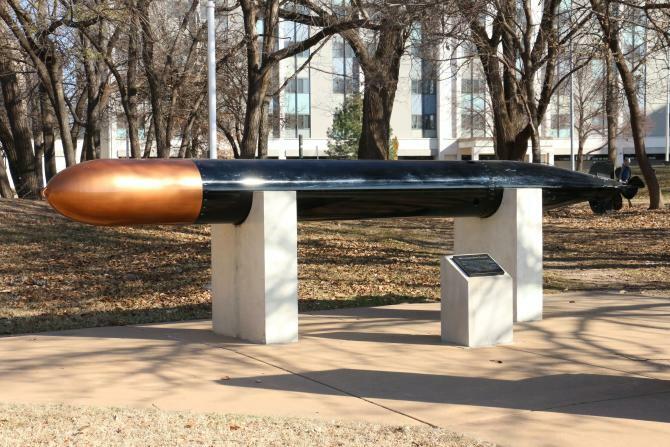 The Dry Docked Dolphins, a Submarine Service group with chapters in all 50 states, assigned a World War II MK-14 Torpedo Kansas. That Torpedo, the U.S.S. Dorado, has been commemorated in this memorial. A U.S. Navy anti-submarine plane shot down the original torpedo as it neared Panama. The military believed it was a Nazi submarine on Gulf Patrol. More than 1,500 United States military men and women were killed on Dec. 7, 1942, when Japan dropped a bomb on Pearl Harbor in Hawaii. 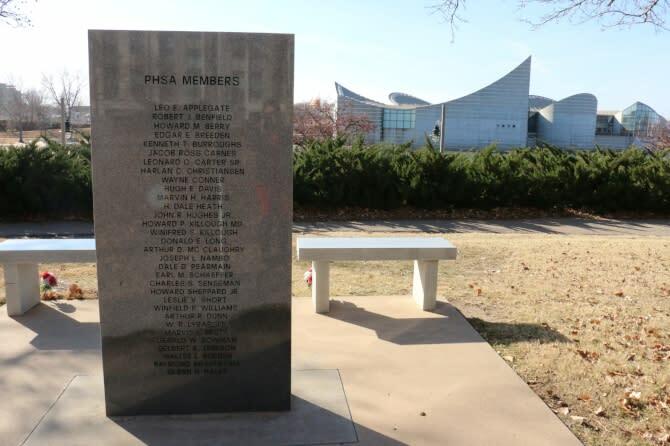 Remaining survivors and their widows meet each year to remember that fateful day, but you can learn about the history and the soldiers from Kansas lost at this memorial any time. Kansas only has about 10 survivors still alive. The World War II Memorial was dedicated in May 2017. You can reach the two black granite bricks through three pathways of commemorative bricks marking the names of men and women who served in World War II. The big, granite panels are 6 feet tall and 8 inches thick, and honor the branches of military and supporting American forces. The memorial was dedicated in memory of the 70th anniversary of the attack on Pearl Harbor. Honoring those service members who fell at the hands of terrorism, the Operation Freedom Memorial was dedicated in the park in 2014. 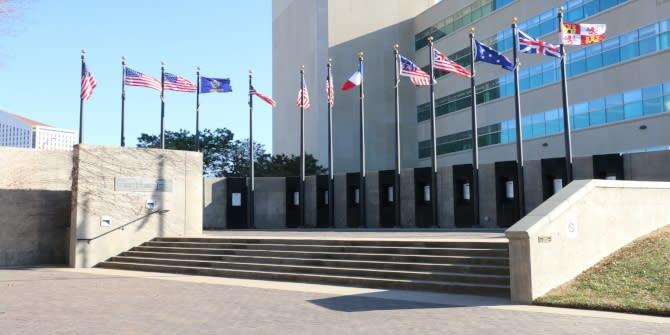 These black granite walls list the names of all of the Kansas servicemen and women who died in conflicts related to the war on terrorism. After World War II came to an end, America sent the U.S.S. Wichita to Japan to free prisoners of war. The warship earned 13 Battle Stars during the war. 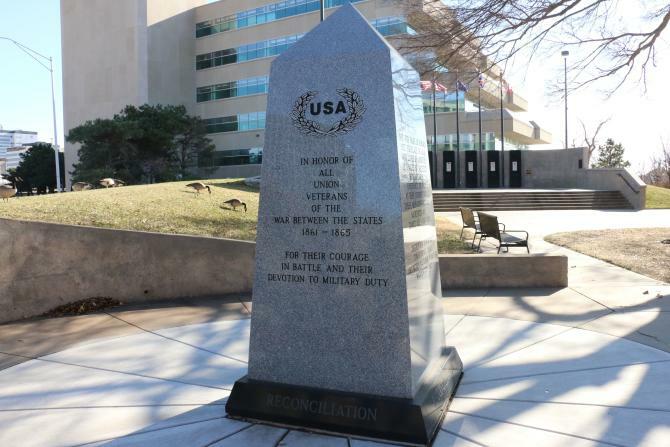 Now, near the Arkansas River, this stone monument symbolizes the original ship and commemorates its service. The United States saw the loss or injury of nearly 13,000 colonists during the Revolutionary War, which began in 1775. This memorial remembers their sacrifice as they fought to build the foundation of the country we&apos;ve grown to love. 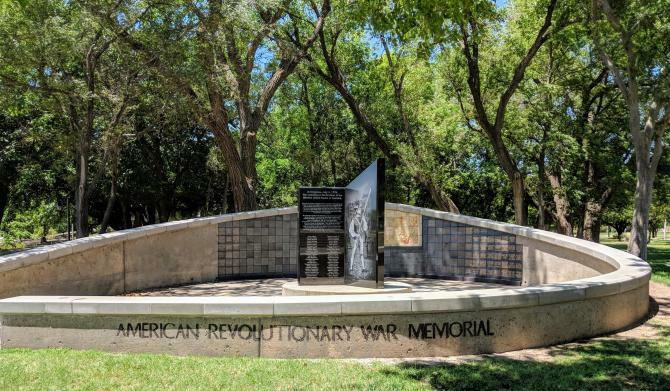 The American Revolutionary War Memorial will be dedicated on July 4, 2019, and has the original 13 colonies and the preamble to the U.S. Constitution etched into it. Kansas was one of the last states admitted into the American Union before the dawning of the American Civil War. Because the state rejected the idea of slavery, it fought with the North. That created conflict with neighboring state Missouri, which was a Confederate state. The Reconciliation Memorial at Veterans Memorial Park pays tribute to both the North and the South, showing unity between the two sides after the Civil War ended in 1865. This memorial was dedicated in 2016 and replaces the Confederate flag that was removed from the Bicentennial Flag Pavilion. It happened during the Cold War - the United States drives food and water into West Berlin after Soviet troops blocked all land routes into the city. It took more than 200,000 planes to carry more than 1.5 million tons of food, clothing, medicine and other supplies into the city. Wichita is one of only three Veterans Memorial Parks in the country that will have a monument honoring the Berlin Airlift. 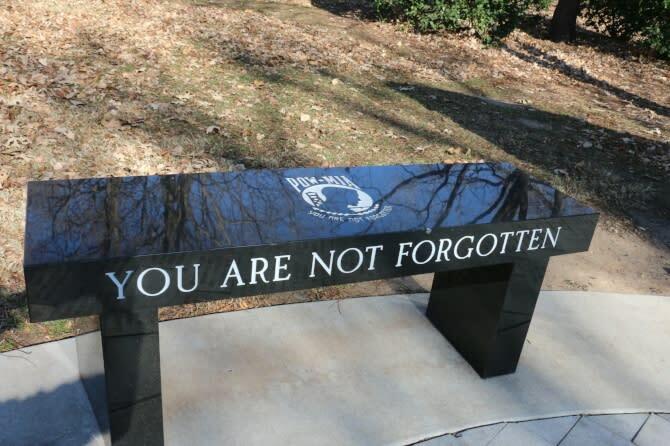 Wichita’s memorial will be placed along the walkway between the Vietnam Veterans Memorial and the Gold Star Mother Memorial, and is set to be dedicated Sept. 26, 2019. The Veterans Memorial Park organization is currently working on creating Veterans Memorial Walkway, a memorial reserved for Vietnam era Veterans (1955-1975) paved with about 1,500 bricks. There will also be a spot next to that with Korean era Veterans. The walkway between the two and the World War II Walkway will be for veterans from all eras. 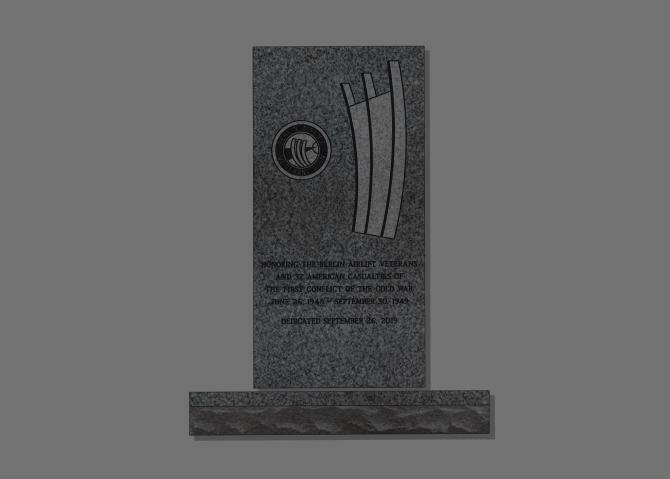 This will give family members from different generations a chance to place their stones next to their kinship. 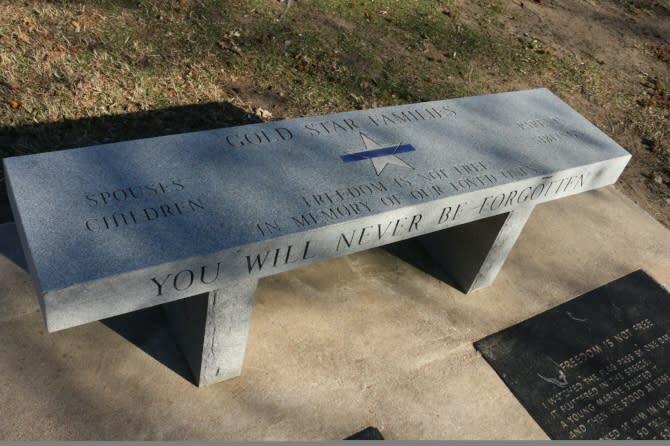 To purchase a brick, complete the application and mail a $100 donation to Veterans Memorial Walkway, P.O. Box 4031, Wichita, KS 67204.